This hearty, fragrant, richly spiced lentil soup can be cooked in the pressure cooker in about a half hour or on the stove in an hour. The colors also reminded me of one of my favorite lentil soups, which you may remember as Rainy Day Lentil Soup. I’ve created almost a dozen lentil soup variations, but this is the soup I think of when I hear the words “lentil soup,” and it’s the only brown lentil soup I make that’s seasoned with coriander and cumin–just faintly, not enough spice to rival Middle Eastern Red Lentil Soup or Ethiopian Inspired Red Lentil Soup, just a subtle hint that’s warming and inviting on a blustery fall day. I realized as I was making the soup that I’ve actually changed the recipe slightly over the years. I always increase the amounts of onion, potatoes, and carrots and add a little extra seasoning to the pot near the end. The results are a chunkier soup, almost a stew. I didn’t want to just change the original recipe because so many of you have told me you love it, so I’m presenting my updated version here. The quickest and easiest way I’ve found to make it is to use an electric pressure cooker, such as the Instant Pot or Fagor Multicooker, both of which I love. But if you don’t have a pressure cooker, you can make this hearty soup in a Dutch oven or large soup pot. It will probably be even easier in a slow cooker, though I haven’t tried that. Let me know in the comments if you have and what settings you used. Cook this rich and fragrant soup in the pressure cooker and have it on the table in about a half hour. But if pressure cooking is not your style, simply cook it in a covered pot over low heat, adding extra water as necessary, until the lentils are tender and then proceed with step #3. Pick over the lentils and rinse well. Check to make sure the lentils and potatoes are tender; if not, cook, covered but not at pressure, until done, adding water if it seems too thick. Remove the bay leaves, and add the additional seasonings, salt, and spinach. Check the seasonings, adding more cumin and coriander as needed. Cook for just a few minutes to wilt the spinach. Stir in the vinegar or lemon juice and serve. Do I Have a Recipe for Lentil Soup?! This post contains Amazon affiliate links. When you buy something through them, I receive a tiny commission that Amazon would probably rather keep for itself. Your purchase helps support this site and my hungry family. Thank you! I love lentils. By the way, that´s one of the Mexican ways of eating lentils. As a long-time semi-vegetarian, I had never thought that brown/green lentils looked “muddy/dirty”. They were just regular to me, and I love them. Good thing to think about when serving non-veggie relatives. Thanks. Gorgeous, healthy autumnal soup. Susan, your photos are always so inviting. This looks so delicious, I can’t wait to try it. I’d love to make the bread pictured above to go with it. Will you share the recipe? If it is already here, what is it called? Unfortunately, I bought the bread so I don’t have a recipe for it. I tend not to bake bread because I’ll wind up eating too much of it. This looks sooo warming! I love lentils! Looks like another great recipe! Yum and with the cold weather, you’re right, this is the soup we need. Can I suggest that you suggest to Shirley who asked about a meatloaf, to try Dreena’s No-fu Love Loaf that you posted a while back. It is very good and slices nicely. Freezes well too! Thanks! I was thinking the same thing about Dreena’s loaf. Susan, thanks for the reply! I have onions, celery and carrots which I love to put in a brown rice pilaf, so I’ll serve that with your recipe. I’m making it tomorrow, cant wait! This will be tonight’s supper!! I love lentils and this sounds great. I have some baby portabellos I need to use up which I’ll add to it. Off to the kitchen! I made this with the addition of rasam powder..I happen to love spicy food and this gives a whole new dimension to it. I actually have been adding it to everything I make. I picked up this powder in Sri Lanka but you can easily get it in the States.. I will have to look around for rasam powder. That’s a spice I haven’t tried yet! Rasam is a south indian (Indian sub continent) tamarind broth based soup.There are many versions of this of which tomato rasam and pepper rasam are most popular. Culturally rasam is served with white rice(You will have to thorrowly mash the rice and pour rasam over it). Rasam is also partaken all by itself in a glass when someone is sick since it is supposed to be easily digested food and pepper has medicinal values for sore throat and cold. I didn’t know the rest of the info about rasam..I will definitely try the soup! Thank you! I made this tonight and boy, oh boy, was it good!! This is perhaps my favorite lentil soup, tied with the red lentil and collard soup recipe I got from allrecipes.com. I prepared it in my Instant Pot. Thanks for this very flavorful recipe. 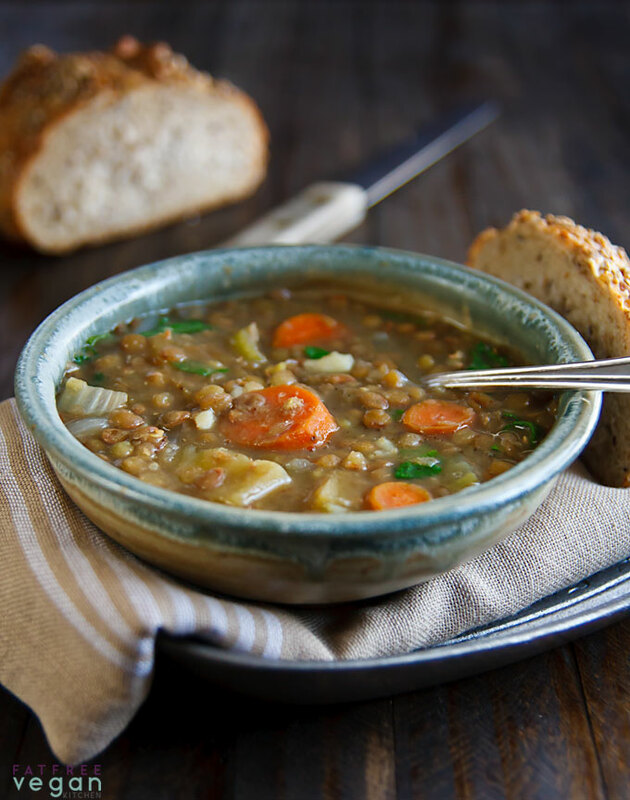 Totally pinning this recipe, Susan – green lentil soup is the best ever! And cumin and coriander just smell so beautiful. Heaven! Yum! I think I will try this in the crock pot. It is cool and crisp here and time for soup! This weekend I made roasted brussels sprouts off one of your recipes. I added a ton of garlic because I had it and it needed to be used. Delicious! Then I baked your Pumpkin Bread and made it without oil into muffins. I was a baking machine. Thanks for the yumminess! I can’t wait to try this! I’ve been craving a lentil stew but was hesitant to jump into it. Thanks for the recipe. This looks amazing! Perfect thing for a cold day. What beautiful writing. I loved the beginning, and felt as if I was right in your driveway and yard with you, savoring the bright colors and textures. Thank you. And what a great lentil soup treatment! I love the combination of cumin and coriander. Now I’m torn. I was toying with the idea of having the red beans and rice all ready when Mike and Kelly arrive next week. But this soup is ALSO a great Thanksgiving Eve meal. The photo makes me want to sit down and dip into the bowl right now. I absolutely love all kinds of lentils. Some incarnation of this is sure to show up at my table. This was very, very good! I had it for lunch today. I cooked it in my crockpot over night on low. I did not have brown lentils so I substituted moong dal. It was divine!! I also added 1/8 teaspoon of black salt (Kala Namak). If you have not tried Kala Namak in Indian dishes, you should. It adds that extra something! BTW – the timing of this post and most of your posts was perfect! Looks yummy. Do you think black (beluga) lentils would work? Also, I don’t eat white potatoes. Could I use a winter squash instead, like butternut? Sure, I think both of those substitutions will be fine. Hope you enjoy it! What a great recipe redux, Susan! I’ve been wishing lately you’d do something marvelous like this and post some of your older recipes! 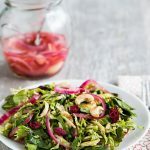 There are so many wonderful things to cook on your website i never get as far back as i intend because i inevitably have all the ingredients for one of your recipes and rush off to make it before digging too deep. Oh, and btw I make a lentil soup that is almost exactly like this one and yields the same volume in my standard crock pot. 4 hours on high, or 8 hours on low. For a more tender “stewy” texture like this recipe (drool) you might want to soak the lentils a bit first. I want to try this soup in my crock pot. How long would you soak the lentils. I’ve only recently started a vegan diet and am slowly learning more about legumes in general. I usually soak mine over night in the fridge, then rinse them and just dump it all in the crock pot. If you soak it you don’t need to cook as long and the longer you cook the more they break down. I like mine more firm but they’re delicious any way they’re cooked. This is a really great starting point for lentils and is totally fool proof; you’ll love it whether it turns out soupy or stew-y. If you like lentils you’re going to love Susan’s blog. She is the master of the lentil! You will learn to love the legume! I can’t believe how good and filling this soup is! Had it tonight for dinner as it is very cold in my house (with no heat) despite the 70 degree day. I will make this again and again. My whole family liked it even my picky 11 yr old who said, “I didn’t ‘not’ like it.” haha, that means he liked it. I didn’t have any vegetable stock or bouillion so just used water and it worked well. I added a little Summer Savory seasoning and a touch of ground cardamom. I didn’t have any coriander so I added more cumin. Mmm…mmm…. 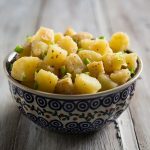 Wow, Krista, summer savory and cardamom with the cumin–what an inspired variation on the seasonings! Thanks! These tweaks lend to ‘secret ingredient’ status 🙂 Summer Savory is so awesome! And I know this recipe is a definitely a keeper. I think I will try this next week in the crockpot! This looks delicious! Love a good hearty soup this time of year…and one that comes together easily is definitely the day to go! Susan, what a great soup and great use for the pressure cooker! I made this last night in practically no time and the taste and texture were terrific. I’d never been a fan of lentil soups because they alway seem to be lentils just floating in flavored liquid and maybe, depending on the recipe, pieces of vegetables. This soup beautifully melded everything into a thick, stew-like bowl of goodness with perfectly tender lentils and vegetables (and it looked pretty too). And the fact that I so quickly put it together after coming home from work is awesome. Thank you for inspiring me to eat healthy, great tasting food! Thank you so very much Susan! . 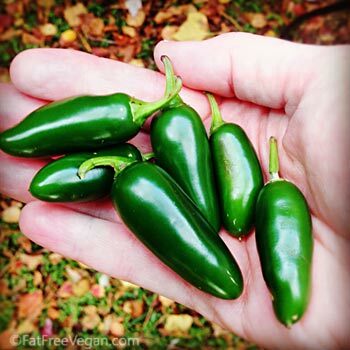 When I decided to become a vegan, I thought, my gosh, what would I eat? I can’t imagine food would taste well without chicken or meat or seafood. Now I have so many recipes to try. Thanks to you! You are a wonderful person! What brand of vegetable bouillon cubes do you like? I haven’t found one I love, so I usually just use water and salt. I like Rapunzel brand which I find in Whole Foods. Those are good to have no hand, but it’s easy to make a batch of vegetable broth and freeze or can it. I should definitely make some broth in the pressure cooker. I like the Not Chicken cubes by Edwards & Sons. I made the soup tonight with a combination of Susan’s spicing and Krista’s. I used it all and it was great. I used a white sweet potato and a German butter ball potato from my garden stash, and a few tomatoes pieces, too. Instead of celery, I used some lovage I had in the freezer. I make the chickeny buillon cubes from the Vegan Slow Cooker. I used up the last ones I had made with lovage during the summer. Thanks for all the inspiration you two!! We certainly have the village it takes to make delicious meals. Thank you. I haven’t tried that brand yet. I just made this for me and my family. It was so good and super delicious! Warm and wholesome.. The perfect rainy-day winter meal! 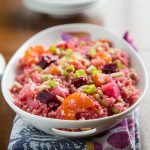 I love this blog so much and I use a lot of these recipes as they are easy for me to make and super healthy too. I am 15 and vegetarian. This blog has really inspired and helped me a lot! I make big pots of the stews and soups on the weekends and freeze them in portions so that they are ready for me during the busy week days as the rest of my family are not as vegetarian as I am! I honestly don’t think I’d be able to do it so easily without the help of this blog! Thank you so much for your comment, Ciara! I’m so happy that my blog has been helpful to you. 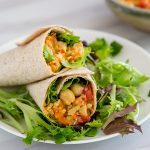 I think you’re so wise to make batches of soups and stews on the weekend–it’s that kind of planning that really makes a vegan diet easier to fit into a busy schedule. Good luck to you and happy holidays! Yet another winner from you, Susan! 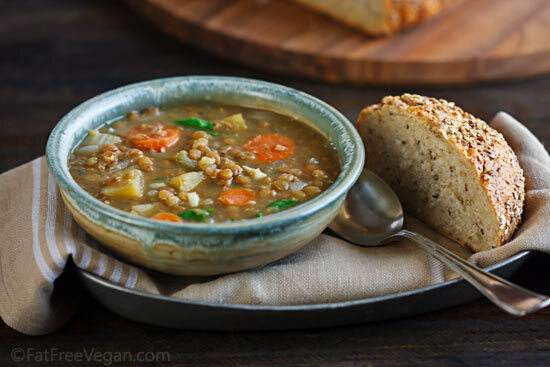 I have been using the same lentil soup recipe (from an old PETA cookbook – “The Compassionate Cook”) for many, many years. I saw the picture of this on your site and had to try it. Fortunately, the only thing I didn’t have on hand was a few potatoes, so I picked those up. I cooked it on the stovetop and it was fantastic. We dipped some roasted garlic ciabatta in the stuff and are full. Thanks! It was cold and rainy yesterday and this was perfect for dinner. Thank you Susan for another delicious recipe! I’m definitely keeping this one in my rotation. Your blog is an inspiration! 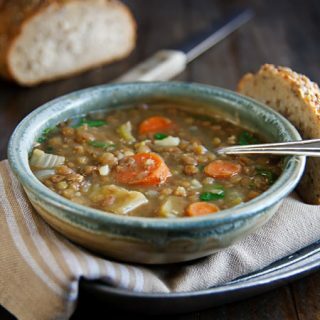 I love lentil soup and this one looks absolutely delicious. Healthy and wholesome. YUM! I just made this on the stove. I added a small zucc when the kale went in and some hot sauce at the end and it is SO delicious… Trying not to eat the whole pot.. This looks and sounds so delicious, i cant wait to try it! This is bubbling on the stove now and it smells fantastic! Okay, my husband and I just devoured dinner! Daughter did not really try it but she is 22 months old and not big on trying new stuff. This is amazingly delicious for such a simple recipe. I do not have a pressure cooked so just did it on the stovetop and my lentils and potatoes were well cooked at 35 minutes. Thanks again for such a great recipe! I’m so glad you liked it, Robyn! Yummmmm, just made this in my pressure cooker, my 3 year old twins asked for seconds and THIRDS!!! Deeeelish 🙂 I always know to come to your site first to seek out a recipe, yours are always the best and have the best pics too! This was delicious! We loved the spice combo. My 13 year old daughter nearly polished off the pot! Thank you for including pressure cooker directions. This really was quick and easy; I promised I’d pull together dinner sooner than if we went out, and it worked. Ahhhh…. I’m loving the site and your recipes! I’ve just bought a vitamix at a food show. I’ve been considering it for ages and have finally taken the plunge. The main reason was so that I could use it to make healthy soups from scratch. Unfortunately, most of the soups that I’ve made have been bitter – due, I imagine, to the fact that I’m not cooking the veg in the traditional stove-top fashion. Before I return the vitamix, have you any advice that will ease my concerns? I made this soup last night and it was DELICIOUS. My husband and I were practically licking the bowls. This has been officially added to my recipe binder. Love love loved it. This is perfect – not only do we love lentil soup and the spices cumin and coriander, but we just got a new slow cooker after several years without one and I’m gathering up some good recipes to make in it. I’m definitely going to use it to make this as soon as I’ve gotten all the ingredients! Thank you, thank you! Can this be made with red lentils? If so do you wash the red lentils until water runs clear? Having our coldest weekend this season in Orlando, FL. Couldn’t pass up making this for dinner. I have plenty left to eat this week. Thank you so much for another great meal. I tried this one and it went down well, thanks. The ground coriander makes this! I made this soup this afternoon, with the help of my two girls, and I have to say….This soup is absolutely amazing! We made it on the stove top, and the only things I changed was adding one more bouillon cube, and an extra 1/2 tsp of cumin. This recipe makes a hearty, savoury, delicious soup, that my girls could not get enough of. I added a couple handfuls of baby spinach leaves just before turning off the heat, and although my girls don’t really like spinach, they gobbled it up! They ate two bowls of it right away, and will be eating more as soon as they are hungry again. They were actually disappointed that they were too full to have more…lol. Thank you so much for such a wonderful recipe. I will be making this one often. My poor Husband, who is on a juice fast at the moment, had to smell it when he came home from work….talk about torture. He’ll be getting his own fresh batch as soon as he’s off of his fast. Thanks again! Delicious! I doubled the amount of vegetables and the spices/seasonings. This is my favorite lentil soup recipe!!! Thank you!! This is a solid (as in reliable), easy to make soup with ingredients normally in the refrigerator. Tasted good. I let cook on the stovetop and it took way less than an hour, however, I am one to forget the lentils and let them boil too long in the beginning! Recently been introducing my boyfriend and his family to vegan food. It’s recipes like this that show people vegan food can be hearty also 🙂 They enjoyed this very much!